This section includes general information on what is on these pages. This includes the creators of the site, the history of the FAQ itself, what a Land Rover is, as well as how to join the land-rover related mailing lists. Start here for a brief description of the site's gestalt. We hope you enjoy it. There is a good deal of useful information on the site which we have been compiling since the early 1990s. The FAQ also contains information on how to identify specific Land Rovers (Series I, II, & III), Range Rovers, Discoveries, Lightweights, and Dormobiles). Here we have our Quick Vehicle Identifier. To the uninitiated viewer the difference between the versions of the Series and Defender vehicles is subtle. In these pages we have tried to detail the differences and specifications of each version of the vehicle. Also included is Ident-a-Rover, an interactive program that will help you to identify what model vehicle you saw. Here you will find History, Production, and Sales data on Land Rovers. There is a timeline of the history of the company, starting with its creation back in 1947, the dark days of Rover under the helm of British Leyland's Solihull stewardship right up until the company's purchase by Ford Motor Co. in May of 2000. You'll also find a history of the vehicles themselves. 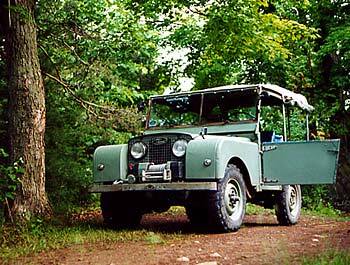 From Spencer and Maurice Wilks' first prototype Series I on a Jeep chassis way back in '47, all the way to today's highly advanced coil sprung Range Rover, Freelander, Defender, and Discovery models. You will see examples of old advertising, some quaint and others absolutely hilarious. You'll learn how to decode serial numbers, and also how to get build sheets on your vehicle as well as production data and sales data. How to repair and maintain your Land Rovers and an alternate parts list. There is also a collection of articles & tech tips from the internet and Ottawa Valley LR Club's newsletters on Series vehicles through Range Rovers and 101's on various maintenance items. If you need diagnostic fault codes, paint codes, articles on how to do specific repairs right, and how not to do them wrong, adjustment procedures, this is the section you want to explore. Whether you are trying to source a much needed U-joint locally to replacing crumbling window channels in your Series vehicle, this is the place to find it. From the feedback we receive from visitors to the Land Rover FAQ we know that some of these can be really helpful. Land Rover Parts suppliers, Clubs, Customs Information, Books, and other Publications. There are also URLs for internet resources for your vehicle. These include Web pages, ftp sites and more, both amateur and commercial. If you are looking for a parts supplier or club in your area, this is the place to go. A lot of the clubs have meets or get togethers on some sort of a regular basis. It is a good way to meet other owners of Series and other Land Rovers in your area. Here you will find information on the Koenig and Capstan winch. There's the very popular Anti-FAQ (aka silly answers for silly questions), several pages of Camel Trophy information, and a listing of Famous Land Rover owners. There are adventure stories, a listing of toys, crossword puzzles, and, if you would rather lick 'em, a philatelic section (that would be stamps for the lay people among us). Lots of fun stuff! What's New on these pages! This is a list of recent changes to the LandRover FAQ, in reverse chronological order. Check back here to see if any new information has shown up since your last visit. Here is a list of everything on the site. You wil also find a time index that is sorted by file modification times. Copyright Dixon Kenner, 1995-2018. Last modified December 22, 2018.